Gas fires are beautiful things. We've been working hard to create a range that is not only kind to the environment, but more efficient and affordable to run. Our extensive range of traditional flued gas fires and surrounds incorporate the latest developments in fire technology for exceptional performance and reduced running costs. Our High Efficiency glass fronted gas fires are compatible with Pre-Cast, Pre-Fabricated and Class 1 Chimneys. How do I choose the right gas fireplace and surround? We believe that buying a gas fireplace doesn't have to be complicated. With all this in mind and to help you find the perfect gas fire and surround, we've answered the most popular questions below to get you started. What are the different types of gas fires and surrounds? For conventional flue inset gas fires, we have four different sized engines which differ mainly by providing either radiant or radiant and convected heat, and the physical firebox depth. These are the Chewton (slimline radiant - depth 110mm), Asaba (slimline convector - depth 120mm), Whatley (full depth radiant - depth 180mm) and Walther (full depth convector - depth 250mm). What gas fire styles can I choose? There are many different gas fires to choose from. Frets such as the Blenheim, Elegance, Elysee, Grove and Victorian with vertical lines or ornate detailing are considered traditional, whereas gas fires with horizontal clean lines are considered more modern and contemporary. If you need further assistance choosing the right gas fire for your home, speak to our team directly. What control options are there on gas fires? Depending on the gas fire and surround model, we offer up to three control methods - Manual - Rotary Control, Manual - Fingerslide Control and Remote Control. Is having an efficient gas fire important? The efficiency of a gas fire depends on which model you choose. For example, the Grosvenor High Efficiency Gas Fire range have a glass front which significantly reduces the warm-air being drawn up the chimney. Also, this fire provides additional convected heat which draws in cold air and channels this through the firebox, warming it up in the process and expelling this hot air from the top back into your room. How big does my fireplace opening need to be for a gas fire? It is important to know the opening dimensions (width x height x depth) of your fireplace. The only way to ensure this is accurate is by getting a Gas Safe engineer to remove your existing fire. Generally, the opening is 16" wide by 22" high (w406mm x h559mm). Most modern fireplace openings are the same but the depth can vary significantly. How much heat output do I need? According to the English Housing Survey 2010 the average living room floor area is 3.6m x 3.6m (small dwelling) and 4.8m x 4.8m (medium dwelling) with an average height of 2.4m. Therefore the average volume is 31m³ to 55m³. Approximately speaking to make your room 21˚C when it's 1˚C outside, you will need 1kW of heat output for every 14m³ of space. Therefore as a rule of thumb, if you multiply the height, width and length together, to calculate the room volume, then divide this by 14, you'll get a gauge of what heat output is required. This would mean that the average room requires about 2.2kW to 3.9kW heat output for all year round comfort from a gas fire. What chimney or flue do I have? You should always consult a specialist to confirm this. However, to get a rough idea of what kind of flue or chimney you have, take a look at your roof top. Are modern gas fires safe? Every gas fire has a Oxygen Depletion Sensor (ODS) and Flame Failure Device (FFD). These two components monitor the safe levels of oxygen in the room and will shut off the gas supply to the fire if they should fall below a safe level. Who will fit my gas fire and surround? All gas fires and surrounds should be installed by a Gas Safe engineer. Your safety is of paramount importance to us, which is why we offer a nationwide Home Survey and Installation Service to ensure you not only get the gas fire you want, but it is installed and working correctly. How does a flueless gas fire work? Our range of Flueless Gas Fires incorporate the latest in gas fire technology. They do not need a chimney or flue to operate and are designed to burn extremely cleanly. The burnt gasses are funnelled through a catalytic converter system as an additional safety precaution to ensure your fire remains both efficient and safe. In fact, the catalytic converter in our flueless gas fires works so effectively that it can actually help to clean the air by neutralising airborne particles and odours, therefore helping to reduce household allergies. How long does a flueless gas fires catalytic converter last for? Independent tests commissioned to establish the life expectancy of the catalytic converter have proved that even after 16,957 hours (approximately equivalent to 27 years and eight months of normal use)*, the gas fires catalytic converter is as effective as when it is new. *This calculation is based on the assumption of 4 hours a day for 5 months of the year. Do flueless gas fires cause condensation?All of our flueless gas fires are designed to supplement central heating and should be used as a secondary heat source only. Therefore, the background ambient temperature of the room will prevent any moisture from condensing on colder surfaces such as single glazed windows. *For installation in the Republic of Ireland, two fixed openings are required with a minimum effective opening each of 60cm². Both ventilators should be fitted on the same wall, one at high level and one low level with a minimum vertical separation of 160cm. 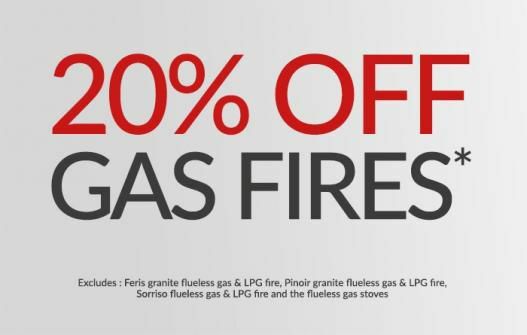 Gas Fires UK - Browse the full range today! When it comes to choosing the right gas fireplace and surround for your home, we know you’ll want a wide range to choose from and exceptional product quality when you’ve found the perfect fire for you. Our extensive gas fires and surrounds range features over 100 individual fires and has been specifically created over the last 30 years to cover almost any style or design. Add that touch of quality to a room or make one of our gas fires the focal point of your home. We understand that more traditionally decorated homes will need a gas fire to match, which is why we have several traditional gas fire designs to choose from. Similarly, a more contemporary home will want a sleek and modern gas fire to complete the look - something we also offer within our range. Gas fireplaces and surrounds are one of the most popular ways to transform the feeling of an entire room thanks to their stylish designs and high efficiency. Warm your home with a gas fire that can also be operated without the heat if you just want that fantastic flickering flame effect on a summer’s evening. When winter rolls around, simply turn up the heat, sit back and relax in comfort. From wall mounted and flueless gas fires to inset and free standing gas fires, we really do have something for everyone. Not only that, whatever style of gas fire you’re looking for, our experts are on hand to help you make the right choice. Want to see our gas fires and surrounds up close? Come and visit our fire showroom to see a selection of our gas fire products in action! Need more advice or a Home Survey? For more great tips online, please see our Gas Fires - Product Guides within the Help & Advice section. If you're still not sure where to start with choosing your gas fireplace and could do with a helping hand, get in touch. Customers come to us for our wide choice, great prices and unbeatable product knowledge. If there's something we can help you with or you've got any technical questions, contact our friendly sales team on 01202 588 632 or email us at sales@superiorfires.co.uk. And, don't forget we offer a nationwide Home Survey & Installation whereby we can send out a Gas Safe Registered engineer to help make sure you get exactly the right fire for you and know exactly what the costs are before you decide to proceed.